As VirginMedia users we are in the position of being able to have an internet connection without a landline. The thinking that asks whether we want to do without begs the question of the future of landlines. What drove us into this position was the number of unsolicited calls we receive. that is after using the Phone Preference Service (tpsonline.org.uk). Milder versions of unwanted call, people you voluntarily gave your number to, including family and friends, are your problem. I wrote about this in the earlier essay. One still receives what are labelled silent and abandoned calls. I discovered that some automated calls only begin once you’ve responded, so if you say nothing, so do they. I suppose this could be perceived as frightening (all that is missing is to replace the musak with tape of some heavy breathing); I also imagine that call centres don’t always succeed in connecting the ‘next’ lead to a person. Some of these automated calls are from bodies purporting to be from the government and are usually offering some heavily subsidised apparent benefit for the house, generally in my head to be described as more sales-I-don’t-want. My brother asked if we’d used the TPS: my long-winded reply went mostly like this. Did that the very first week we moved in. I researched what to do early on and have checked we have done all we can. The issue stems from Virgin Media re-using numbers, so the previous holder of our number left his number with a host of callers, amounting to one per day—quite possibly why he moved. Then we have a load of calls from people purporting to be ringing on behalf of the government, with offers for things from extra house insulation to new boilers. All these calls are labelled 'important' or 'urgent' and I reckon 75% of these are automated: one game we play is to pick up the receiver and say nothing; when there is a machine at the other end it won't start the recording until there has been a response. The biggest effect [on the number of unwanted calls] was when I moaned to a real person who was making calls and he said that the magic incantation is "This is a reused number". He then took us off 'his' system, which has reduced us by around five calls per week. Subsequently I am waiting for 'real' people calling so I can ask them to take us off their databases too. I got in touch with Virgin about losing the landline altogether, which is something that only Virgin users can realistically do. There is a sub-charge of £16 per month for the landline; Virgin's service comes from optic fibre. However, moving the bundled services to exclude the phone shoves the monthly charge UP by £7.50. Effectively the phone is subsidised by the other services, though one can think of other reasons for landlines to be so encouraged. The nice young thing at the Virgin response desk managed to suggest that I unplug the damn thing without actually giving me a quote to that effect. [Which I thought cleverly done]. In our first year in residence we counted in excess of three calls per day coming down from six. Across the year there were three calls that were wanted, each of these was from people saying, basically "pick up your mobile". In the third six-month period (i.e. in our second year) I had a load of genuine calls from various workmen [which raised the ‘wanted’ proportion] and the total calls has dropped since "this is a reused number" began to take effect. There is still at least one call a day, probably 12 per week, of the automated sales/service calls and I think that even now the average number of calls for this second year has less than one call a week of the 'wanted' category. So, one is left wondering why we have a landline. It costs at both ends if one rings the house from a mobile; we don't need it for an internet connection; we bought a cheap (and rather nasty) phone set to use and it doesn't do blocking or recording. At the time we thought we were right to buy this because we knew we wouldn't use it much. Now we rather wish we'd spent more so as to stem the stream of unwanted stuff, but realistically that would mostly only be useful when one has dealt with the nuisance. Skype works far better for family calls; C rings China on the mobile for far less than a local call on the mobile [2p/min against more like 10p/min on another network and 6p per text]. All of which means that in essence the landline is there for back-up. Call quality is no better than a mobile and often worse. Yet as back-up it fails simply because of the level of unwanted call. Which gets us back to the beginning. So are the days of the landline numbered? I noticed when in South Africa in 2003 that mobiles were permitting a great deal of business to occur among people who couldn’t afford a landline—and in many cases, where landlines would not be supplied—in shanty towns. Thus the mobile was causing economic growth and I was told this occurred right across Africa. Brilliant, that. The US and UK networks are over a hundred years old¹. Voice over Internet Protocol (VoIP) means that phone services can be provided by routes other than traditional landlines. Skype is one such system. The essential difference is between circuit-switching (PSTN² and packet-switching (VoIP). I found a US census report showing landline usage. This used to be a measure of well-being (see, and Fig 7 there). 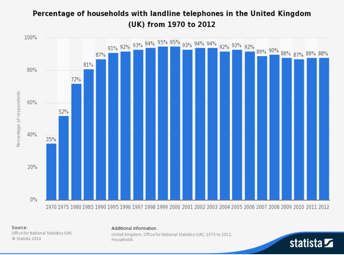 in 2011 over half of the 15-29 age-group had no landline ands over a quarter of all households used mobile only, while under 10% used landline only. The similar diagram for the UK shows a decline from a peak of 95% in 199 to 88% in 2012. Increasingly it is difficult to count this in a way that helps understand the assumed drift away from the landline; in an era where almost all teens and many pre-teens have their own mobile, counting whether there is a landline at home seems largely irrelevant. Facts from OfCom, 2015: 80% of UK adults have broadband, typically spending 31 hours a month browsing online. There are 25.5m residential fixed landlines and 93% of adults have a mobile phone, 2/3 a smartphone. 15% in UK live in a ‘mobile-only’ home. The number of 4G subscriptions went from 2.7 to 23.6 million across 2014. Meanwhile the addressed letter volume in the UK dropped from 12.9 to 12.3 billion items, really not very much change. So, stiil with Ofcom, the smartphone is now the device of choice, used for around two hours a day. As of the day of the report, around a third prefer the handheld for going online and a similar number will stick to the laptop. This is a shift of at least 10% on the previous year. And it’s not especially age-related, in the 55-64 group mobile ownership has moved by nearly 10% a year since 2012, to 50% in 2015. Use the link³, it raises some more questions (not for this essay) about social change. The left-hand diagram suggests that at some point in 2015/6, those lines will cross. 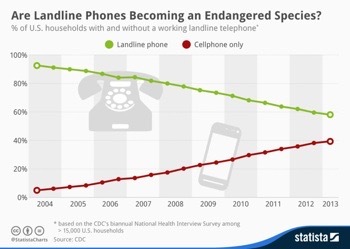 Meaning most US households are landline-free, about now. In the US, 80% of those under 30 don’t have, or hardly use, a landline, versus the 60+ group with the reverse attitude. I found a report that observes that the usage time for different devices has huge overlap, 42% using their mobile while watching tv. That says nothing good about the delivery of content in either medium, something I have moaned about for at least two decades. 200Mbps. 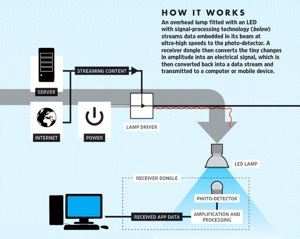 Imagine using low-wattage LED bulbs that flicker at high speeds to communicate with devices in the home. Experiments in 2015 exceeded 1Gbps. These might well be the same lights you use to see your way in December. Walk in front of the light? No probs, send it again - at several orders of magnitude faster than you’ve been using recently, there’s no shortage of capacity to repeat. Storage might be an issue, but perhaps we’d stream rather than store much as mobile users tend to do now when watching tv. See, and here and here. This would mean that our new solar panels would become the receiver for signals (wow). It brings about the Internet of Things without a huge jump in energy consumption. Anywhere you use light it could become signal; so the streets at night would be LiFi sources, cars would communicate with each other and with the street lamps. The more I listened (TED talks) and read, the more I thought that night-life would change its character. Abusive calls: different category of problem. Dial 999 if immediate threat; 101 if in no immediate threat and call the ‘malicious calls team’ of your provider. 1875 Bell (& Watson) made an experimental phone, filing a patent in 1876 and demonstrating it. You can find similar references for the preceding twenty years. 1877 Lord Kelvin exhibited such a phone in Glasgow (UK, not the US). Bell telephone co formed in US. 1878 Bell demonstrated to Queen Victoria and made long-distance calls (using telegraph wires). 1879 the Edison Telephone Co registered in London. 1884 first trunk line, first upright switchboard. GB has phone service from 7 companies. US equivalent 1877. 1889 Strowger produced early telephone exchanges, becoming the standard exchange in Britain in 1922. 1904 three million phones in US. Several competing systems not connecting. 1963 International subscriber trunk dialling (ISD) starts. 3rd transatlantic cable (lasted ‘63-’86). 1965 commercial comms satellite launched. microwave transmission introduced. 1984 British Telecom is privatised. Slow move to digital exchanges. 1967 cable to Australia, HK and Singapore completed. Pulse Code Modulation (PCM) introduced. 1970 telephone directories introduced in the UK. 1971 UK can dial direct to US from major exchanges. 1972 UK passes 10 million lines. 1st Email program written (Bolt Beranek & Newman). 1973 mobile phone demonstrated at Motorola. 1974 ISD extended: UK can ring NZ and Oz directly. 1978 optical cable connection with Europe. 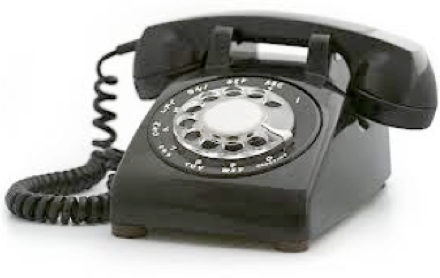 1979 STD (begun in 1958) completed: direct dialling for all in UK. 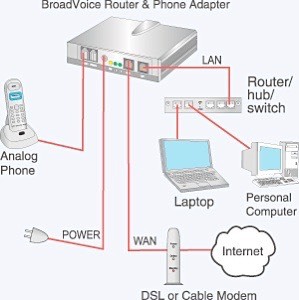 2 PSTN - public switched telephone network also called POTS, plain old telephone system. See. 3 Ofcom tells us we (the average body, no idea of the spread) spend 3:40 hours in front of the tv (going down steadily, most among the young, as if it is a learned habit), £:03 with the radio (steadily going down 6 mins/yr),1:54 on the smartphone and 1:09 at the laptop. half of us say they don’t have the mobile at a shred meal but 42% will check the phone in the same circumstance. 34% of adults check their phone within 5 mins of waking (wow! even if it’s not being used as an alarm?)). internet usage per week (16+) 9:54 in 2005 but 20:30 in 2014. Hours, Doubled. Unfortunately in the UK Virgin don't cover nearly enough of the population for people to cut their landlines altogether (though VirginMedia is NOT really fibre, it's fibre-to-the-cabinet and co-ax to the home, so even then it's still a copper connection). The data part of this is DOCSIS 3 but though not a copper-pair, you're not going to get fibre to the home by this route. 2018 edit. The law has changed regarding what we refer to as nuisance calls. See here for changes in 2016 and, 2018, here. So why does it continue? There seem to be three classes within the remainder: the officially sponsored cold-call, such as those trying to persuade one to take advantage of a government scheme to improve things; those attempting to run down outstanding debts; those working a scam. Which, in some recursive way, means that scammers must attempt to emulate one of the previous two, or somethign quite different, like the police (or the law in general). However, if you have ‘given permission’ to be called, then on your own head (ear, really) be it.